Dr. McCalla received his medical degree from Howard University College of Medicine in Washington, DC. He completed a residency in internal medicine at Mount Sinai Beth Israel Medical Center in New York, NY. He then went on to finish a fellowship in infectious diseases at two training sites: Westchester Medical Center/New York Medical College and Metropolitan Hospital Center in New York, NY. 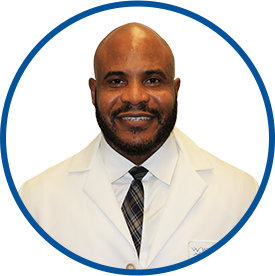 Most recently he was an infectious disease specialist with Kaiser Permanente in Atlanta, GA and, previously, with Infectious Disease Associates in Riverdale, GA.
Dr. McCalla is a member of the Infectious Disease Society of America.